I haven't looked to see how I've done on my winter stitching list since I wrote my half term report but I'm desperately hoping I've made progress! Let's face it, I could hardly have got worse...at least I hope I haven't! I'm linking up with the lovely Sarah@Fairyface Designs so after you've read my report please go and see what other (more successful) people have done. Done! 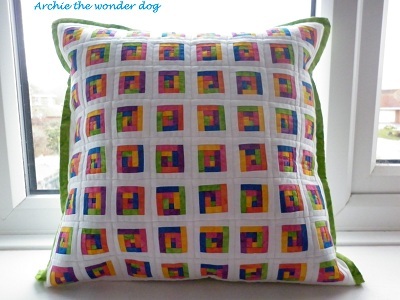 I made this cushion for Nicky and I think hope she's forgiven me for taking so long to make it! 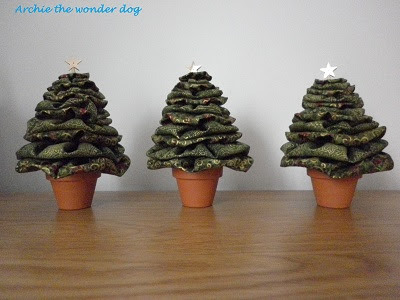 I didn't do this as I got bored with it - my new deadline is Christmas 2012, I'd best get started! I made the tree triplets instead. 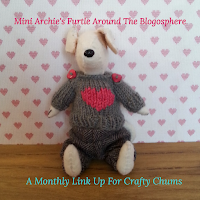 My friend has given me permission to share the pattern for this so I'll sort out some sort of tutorial some time in November - if I forget please give me a nudge! I haven't blogged about it recently but I've cut out the 1000+ 2.5" squares I need for the top and sorted the squares for the nine patches into piles, ready for piecing. I haven't got any further than that but I did say I only had to start so I'm counting this as done! I changed my mind about the quilt design (after I'd designed it!) and, thanks to Hadley's suggestion (and her wonderful rainbow star) I'm now making a Christmas Cherry Star with the fabrics below plus the fabrics I won from Dana. I'm going to start piecing the quilt in July and I'm aiming to have it layered and tacked sometime in October/November so I can (hand) quilt it during Advent. I'm calling this one done though as I've settled on a design and size (as big as I can make it with the fabrics I have!). I've made some progress since the half term report. Not a lot (anyone else hearing Paul Daniels?!) but at least I've made some. If I was writing a real report I would probably say that 'Helen is making steady progress with her sewing but must continue to work hard if she is going to achieve her stitching goals'. I'll be honest and say that I'm not sure I've done any more that I would have done without the list but it's nice to be able to tick things off! 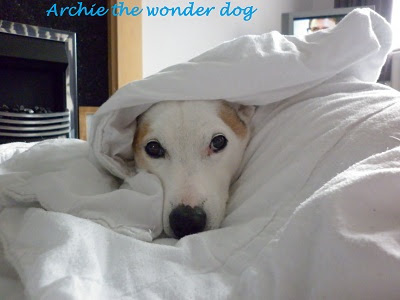 Thank you for all your support and kind comments and suggestions about Archie's (expensive) medicine. I'm going to speak to the vet in a couple of weeks to see if there's a cheaper alternative or if he will manage on a lower dose but, thanks to Nic, I've found it for sale at a smidge over £40 for 30 tablets which will make a difference. I'm also (thanks to Sarah for the suggestion) going to contact the RSPCA and/or the PDSA to see if they can help with the costs. He's not showing any sign of symptoms - if it wasn't for the blood test I wouldn't know there was anything wrong and he's still enjoying his walks (and his food). I'm going to try and get some footage of him on a walk but (apart from today) the weather has been awful and I haven't fancied wrestling with a camera in the rain!! Any chance you could switch on the heating? I've finally started cutting the pieces for my Stained quilt - the Stained QAL is being run by Sarah@Narcoleptic in a cupboard. The QAL has been going since February but I only started cutting fabrics yesterday! I'm not making the same blocks as most other people as I wanted to make the quilt bigger. Also, the quilt is for my mam and she picked out the blocks she liked the most from both of Sarah's stained quilts so I've mixed and matched and also added some blocks. I'm making the quilt from the pieces leftover from making Mam and Dad's quilt so I needed to do quite a lot of planning to make sure I made the best use of the fabric I had. I measured and sketched each piece of fabric, worked out the blocks I wanted to make and the pieces I would need for each and then drew up cutting plans for each of the eleven fabrics as well as drawing up tables telling me which pieces I needed for each block which also (hopefully) helped me make sure I had an even spread of fabric in each block/across the quilt. It took ages but was fun to do (I think that's a combination of the maths geek and the teacher in me!) and it saves getting part way through the cutting and realising I've made a huge miscalculation! I'm going to concentrate on the cutting for the next few days so if I'm not in blog land much it's because I've chained myself to the rotary cutter! Random Fact I currently look as though I have a suitcase under my left eye...I was getting ready to take Archie for a walk and he was very excited (he loves his walks!). As I bent down to tie my shoe laces he hopped up and smacked the top of his (very hard) head into my cheek bone...it's a good look!! Another Random Fact For the past couple of years a pair of ducks have appeared on our street and the street round the corner. We don't know where they come from as we live quite a way from a duck pond but there must be something that draws them over here. 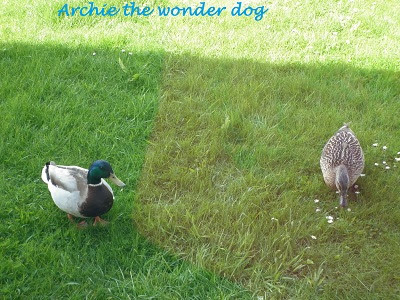 They're such regular visitors that the people who own the two front gardens that the ducks like the most have started leaving a mixing bowl of water and some bread for them! Occasionally they like to visit my front garden for a few minutes to search for insects before making their way round the corner and this morning I managed to get some photos of them. Despite what you might expect Archie isn't that bothered by them. I'm not saying he wouldn't welcome an opportunity to get to know them better but he's not about to make the first move! Yet Another Random Fact The skyline of Teesside changed forever yesterday when two cooling towers and a stack (which were built in the late 50s) were demolished. There are short video clips of it here and here (in the second one you can see the recently relit Redcar blast furnace in the distance). I'm off for a cup of tea and a biscuit - there's plenty in the pot if you fancy popping round! Random fact. We've had two ducks hanging round our patio for the last few days. In the beginning I thought they were cute. Now they are cr*pping all over my patio I am not so sure. Now I'm thinking they would be cuter as Duck a l'orange. Nice cushions and embroidery btw. We had a pair of ducks visit our pond in our last house - was very exciting but they made a huge mess of the pond and their mating was quite disturbing....not quite as disturbing as all your paperwork/calculations, your patience is astounding. Look forward to seeing more stained, sounds different. I'm chuckling because of all your meticulous planing. I cut 144 Different pieces of fabric for my Stained and just crossed my fingers and hoped for the best. I would never have the patience you have. LOL...yes, they are cute if they stay in the pond..I live by the marsh; so I get all sorts of things in my pond...Canada Geese are great to clean up after...lol but pretty to watch. 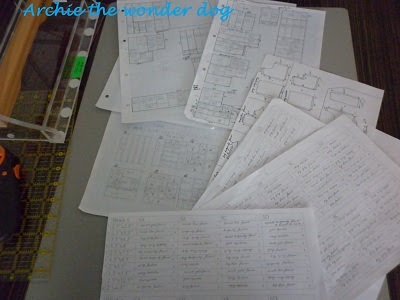 Helen; all of your projects are wonderful....you are very busy and doing well. oh wow what a lot of work those hexies are and so nice to look at. Glad Archie is doing ok and symptom free. Cute ducks...definitely tasty looking ;-) Love your hexies and the rest! Thanks for linking up! You did good, and good luck cutting! PS. Can my parents have their ducks back!? Well not theirs, but all the ones from the pond at the bottom of their road got stolen! Bundled into the back of a transit van! Ooh, well done with that list missus! Sorry, you keep randomly dropping off my blog reader, I've no idea why, most annoying, but you reappeared again today! Great list there and the things you made look great! Love the cushions! Wow, you did fit a lot in :) All that quilt maths looks very scary! Hope your cheek heals up quickly! Phew... it sure is busy fingers at your house! I am so tired reading about your sewing, I need to lie down... I'll have an earl grey, and 4 sugars please...and a bicky straight from the oven if you dont mind. thanks - I'd love to join you for a cuppa ! are those scrap boxes colour coded ? and looks like you've got heaps of projects done - you've been very busy and love those cushions. 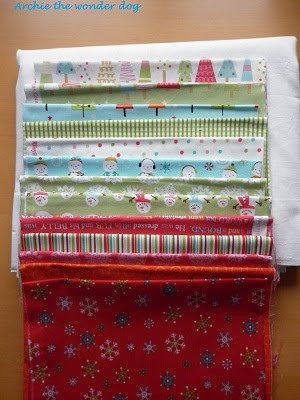 also love the christmas fabrics - they'll look fabulous together and those hexis are just gorgeous - can't wait to see them all together and your report card is just too funny - sounds just like mine ! I was thinking of taking a peak at the Stained QAL but seeing your amazing calculations has made me think it might be just a bit too much work - sounds fabulous though! I think you got huge amounts of lovely stuff done. Hope you're eye gets better soon and Archie stays symptom free. your hexies are beautiful - looking fwd to that post.. The projects are wonderful, and I wish you luck with the cutting. I wish I could come by for that cup of tea! 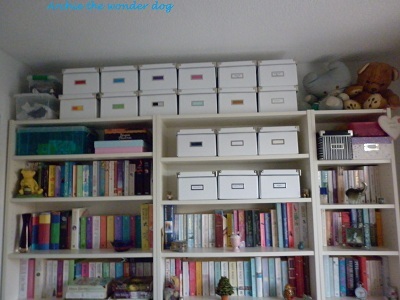 I love the white boxes; so organized. I am about to finish cleaning mine...and it still looks nothing like that....shoot!!!! Thanks for your very nice comment Helen. I'll never be great at FMQ, but better than I was. You have got lots done!! I love those little trees and look forward to the tutorial. Wow what a lovely lot of makes! 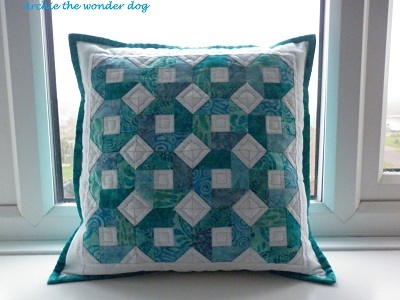 I love the mini shoofly cushion, I've just started making a big one! Sorry just gazing at my gorgeous cushion in stereo - I love it so! My head hurts just looking at those plans! You have got a lot done Helen - and show us the whole picture soon pleeeeeeease! OOOOoh looks like you have been a busy bee! HUrrah for the sorting of the scrap boxes. your room looks might organised... I feel i must go and have a serious tidy up. 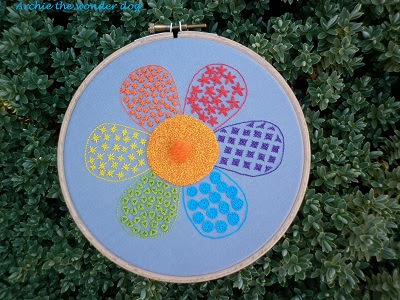 LOVE the embroidered hoop, amazing assortment of stitches and colours there-well done! 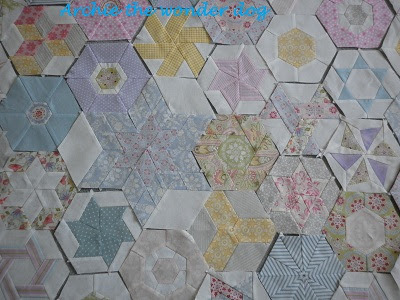 Still totally & utterly love those hexies.... and Archie of course! LOVE the hoop! It is fabulous!